My friend and Pet Parade blog hop co-host, Leah Mastilock, did the beautiful artwork featured today. When we held our one-year anniversary of the blog hop, the co-hosts all donated things to be included in a giant giveaway. One of the items was an awesome cat drawing that Leah had donated. Since I wasn’t allowed to win the giveaway, I asked her about drawing Bentley and Pierre. I was thrilled when she agreed and I think you can see why! L. E. Mastilock is a multi-media artist and works with a variety of high-quality pencils, pens, and paint markers. All of her work is on acid-free drawing paper to prevent fading. Your portrait comes unframed and packaged securely to prevent bending. They can be framed professionally or fit most standard mat and frames. Leah can complete a portrait in 1 to 2 weeks after she receives your photo. During the holidays she gets super busy, so you’ll want to order early for Mother’s Day. 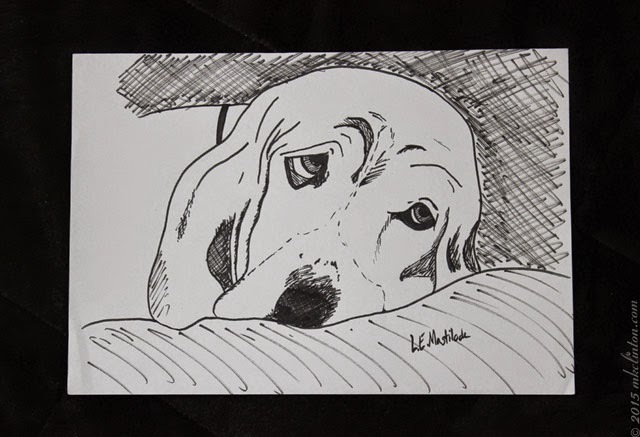 You can commission an 8 x 10 pen & ink portrait for $75. The 8 x 10 graphite pencil on paper is $100. Click here for additional information and more examples of her work. 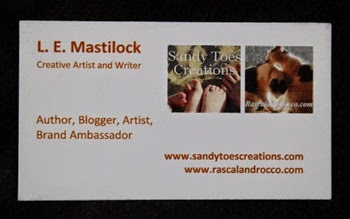 You can also visit her Etsy Shop; Sandy Toes Creations. I believe that she did a marvelous job capturing the Bayou Boys! Thanks so much Leah! 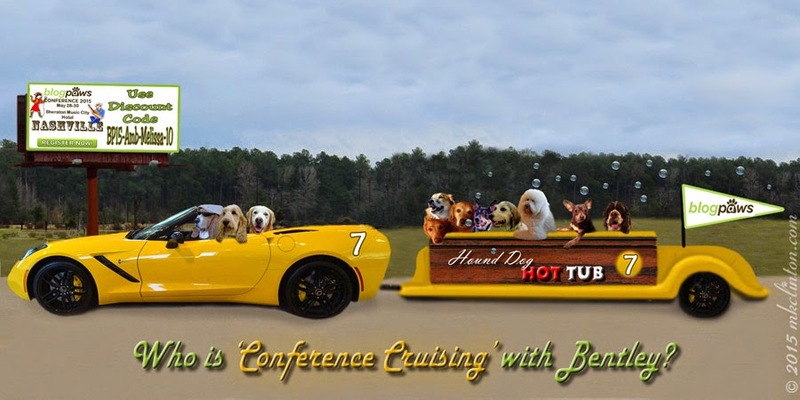 Look who is BlogPaws Conference Cruising today with Bentley! It's our good friend Sugar the Golden Retriever. Sugar is also one of the co-hosts of today's blog hop. She is joining Emma & Bailie, Mort & Tig, Harley & Charlie, Harley, and Dexter! If your pet is joining you at the BlogPaws Conference in Nashville, let us know if they would like to cruise for fun. You can see our newest rider on our Facebook page. We are joining Black and White Sunday’s Blog Hop hosted by our friends Sugar the Golden Retriever and Dachshund Nola. Oh my god!!! Those are beautiful!!! She did such a wonderful job! Her drawings are absolutely beautiful! 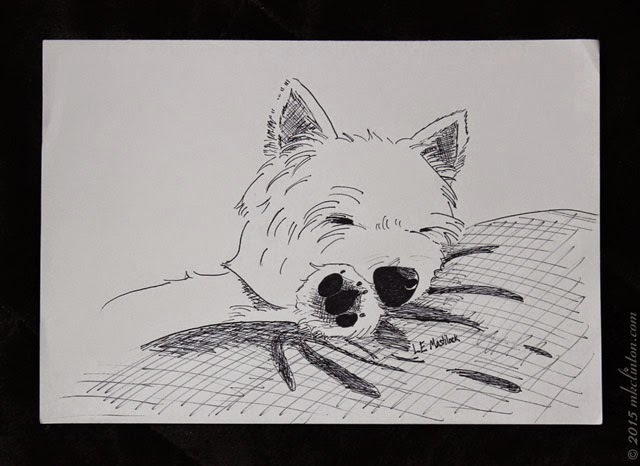 She does such an amazing job...captures the essence of each pet! Love those two she did for you!! Very cute! We especially love the one with Pierre as he looks so happy. Way cool. Have a serene and easy Sunday. that's wonderful, your friend shows all the beauty of dogs in her work. BRAVO! What beautiful drawings! Have a great day. Great drawings. I always like to learn about animal loving artist! The conference-mobile is getting pretty full there! What beautiful drawings Leah does! That is something very special to have. Thank you so much for showing them off. Of course I did have some very handsome models to work from. I so enjoyed capturing Bentley and Pierre. That hot tub cruise looks like a ton of fun! She certainly did an amazing job!!! OMD, those are FABulous!!!! Wowsa! I wish I could draw like that....since I don't have thumbs, I can only draw with the puter mouse, and even then, only stick figures! Your pal has MEGA talent fursure!!! OMD, you guys are cruisin' in a HOT TUB???? OMD, how funs!!!! oh wow those drawings are pawesome!